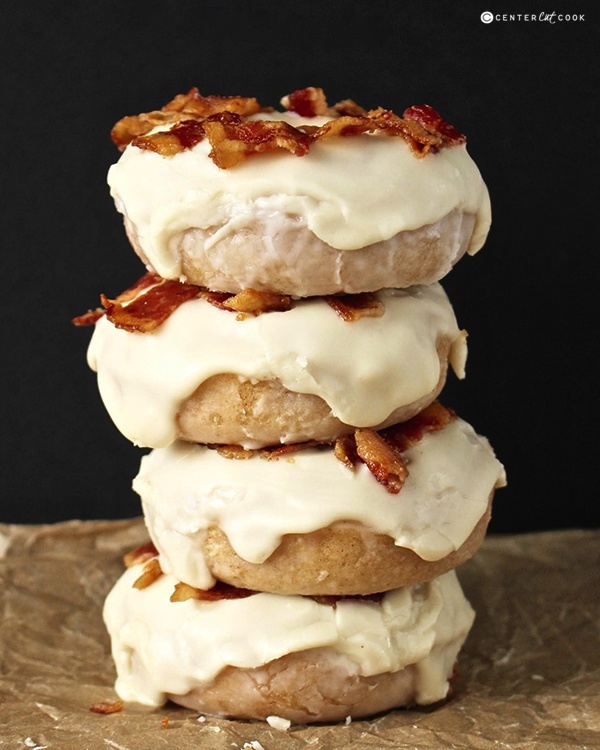 This Maple Bacon Donuts recipe is so easy and the perfect combination of sweet and salty. 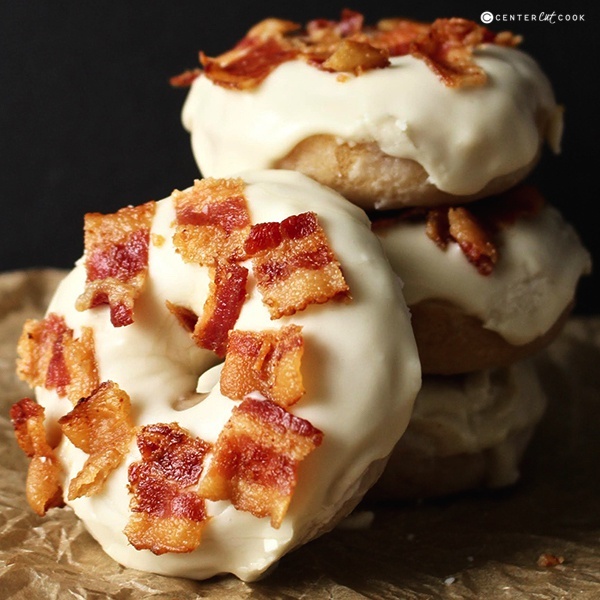 A delicious cake donut, sweet maple glaze, and salty bacon make these an irresistible treat! Hi everyone! I’m Jessica from Jay’s Baking Me Crazy and I’m back sharing another tasty dessert. These Maple Bacon Donuts are so fun! Bacon and maple are meant for each other- don’t be afraid to try it! The only way I like my bacon is dipped in syrup so I knew I wanted to come up with a donut with that combination. If you’re a little hesitant to try it just think of all the other salty and sweet combinations that go so well together- pretzels and chocolate, caramel and popcorn, and peanuts and M&M’s. These are no different- salty sweet perfection! I love my donut pans! I have used them so many times and people are always so impressed with homemade donuts. The secret is, they are probably the easiest thing ever to make! They come together quickly, are mixed in one bowl and are stirred by hand! Because they’re so small they only cook a short amount of time making them great for summer when you don’t want to heat up the house. A lot of donut recipes will say that the have to be made and eaten the same day and that’s not always convenient. Personally, I like to make treats ahead of time so I have an awesome tip for you. Once they’re fully cool, give them a thin glaze and make sure to completely coat them with it. That will prevent them from drying out and becoming stale. Then the day you plan on eating them, glaze with a thick glaze and add the toppings. Problem solved! Preheat the oven to 350° and spray two donut pans with non-stick spray. In a large bowl, mix flour, sugar, salt, baking powder, and cinnamon together. Add in buttermilk, eggs, butter, vanilla, and maple syrup. stir until well combined. Let fully cool and coat with light glaze if not eating immediately. Right before serving, mix the maple glaze ingredients in a bowl and spread on the top of the donuts.